Looking for a book to read this summer? 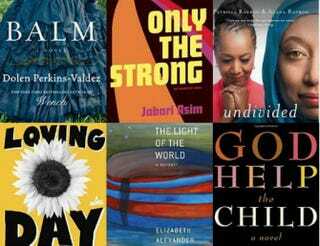 Here are 10 releases by African-American authors published during the first half of 2015. Ranging from memoirs to classics, mysteries to satire, there is something here for readers of all tastes. This powerful, poignant memoir by the poet details the loss of her beloved husband and the importance of love and family. The story begins, Alexander writes, when she met her husband: “I felt a visceral torque, I would tell people, a literal churn of my organs.” Here, Alexander shares a wealth of wisdom and insights amassed from her experience as wife, mother, artist and educator. In the 1970s, the fictional community of Gateway City, based on St. Louis, struggles to survive in the changing political climate after the death of the Rev. Martin Luther King Jr. We are introduced to Gateway City through Guts Tolliver, a hard-boiled heavy-now-turned-legitimate businessman: He has decided not to kill people anymore—unless they really, really deserve it. “The night Dr. King went down in Memphis, Guts had steered his sedan through streets aflame and undergone a change of heart.” Asim, editor-in-chief of The Crisis, the magazine of the NAACP, is a master of crafting fiction that is at once highly entertaining but also socially conscious. Locke, also a writer-producer on the hit TV show Empire, delivers a page-turning mystery set in the world of high-stakes Texas politics. Jay Porter, Locke’s activist lawyer first seen in Black Water Rising, returns for a second installment of sleuthing and courtroom heroics after a third young woman is kidnapped. We never knew how hungry we were for well-written thrillers starring black heroes, and are eagerly awaiting the next installment in this series. This powerful historical novel is the story of Ivoe Williams, a young girl growing up in the segregated Jim Crow South who achieves the impossible: a scholarship to a prestigious college. But when Ivoe returns home, the only jobs that are available to her are the menial work that her parents and nearly all blacks in the South were regulated to. Undaunted, Ivoe leaves the South for good and founds the first-ever woman-run African-American newspaper in Kansas City, using her words to give voice to the struggles of the black community and advocate for social change. Inspired by the true story of Ida B. Wells, here is a sweeping, epic, debut novel that manages to foreground the intimate details of a woman’s life. A Christian mother and her Muslim daughter struggle to heal their relationship, broken on the battleground of religion. “The elephant is in the room and it’s big,” begins Patricia, “still my daughter and I talk around it, pretending our ten-ton problem isn’t there, insisting it will stay quiet and be okay if we just ignore the obvious and keep on moving.” This heartwarming memoir perfectly articulates the many nuances of family relationships as love eventually triumphs over difference. After his marriage fails, Warren Duffy returns to America from Wales to the house in Philadelphia that his father left him. “In the ghetto there is a mansion, and it is my father’s house,” opens Johnson’s novel. In Philadelphia, Warren discovers the long-lost daughter he never knew he had. Here is a tale of daughters, fathers and identity—all crafted in Johnson’s trademark hilarious prose. This memoir by a Pulitzer Prize-winning poet details how a girl from Northern California wound up winning the nation’s highest literary prize and teaching at Princeton University by way of Harvard. “It’s been twenty years now,” writes Smith after describing her mother’s death, “I’ve forgotten so much that I once forbade myself to forget, but I do remember this: snipping five or seven strands of her hair with a pair of nail scissors from her bureau.” Here is a beautiful tribute to the nurturing and intelligence of Smith’s mother and father—to the perseverance and strength of the black family. This much anticipated follow-up to Wench is set after the Civil War. Madge, Sadie and Hemp migrate north to Chicago in search of better lives—“reveling in the city’s spirit, brimming with the effervescence of the newly baptized”—but each must deal with unresolved issues from the past before being able to truly embrace the future.